Rich Rodriguez has a whopper of a story involving Mike Leach swimming in a Speedo. Thursday, April 25, 2019 • R.I.P. Edition • Something about hobo piss. 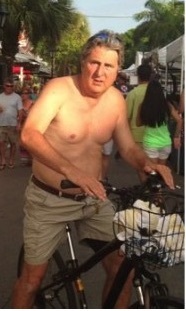 Mike Leach, Image via GameDayr. From the "Why must you insist on saying things I can never unhear" dept. comes Arizona head coach Rich Rodriguez telling a whopper of a story about fellow Pac-12 head coach Mike Leach of Washington State swimming in a lagoon wearing a Speedo. The fact that the story also involves a lagoon, current Ohio State head coach Urban Meyer (presumably when he was head coach of Florida), former Florida State head coach Bobby Bowden, and the late Penn State head coach Joe Paterno, only makes the story more disturbing. Don't say we didn't warn you. The story is so Mike Leach that it has to be true. It will also be fueling your nightmares forever and ever.